This Note discusses in detail – or begins to discuss in detail – the somewhat extravagant thoughts in "Grossman (Lev), Kurzweil (Ray) - 2045: The Year Man Becomes Immortal". It ought to range more widely across the Transhumanist1 literature. The footnotes in the Write-up for the paper2 link to the sections in this Note3. It is currently very much work in progress. I seem to have one of Kurzweil’s books – "Kurzweil (Ray) - The Age of Spiritual Machines". This book has been criticised by Searle – see NY Books: Searle - I Married a Computer. Unfortunately, only the opening section is available for free. But Kurzweil’s site (Searle: I Married a Computer (Defunct)) seems4 to hold an updated version. → "Searle (John) - ‘I Married a Computer’: An Exchange (between Ray Kurzweil and John Searle)". → Ray Kurtzweil (Editor) — Are We Spiritual Machines? (Kurzweil: Are We Spiritual Machines?). This contains (as Chapter 2) the critique by Searle noted above. I dare say that the substance of the Time article is already well worked-over in Are We Spiritual Machines? There’s presumably a distinction between rules-based creativity, which is what (presumably) computers can do, and creativity of a less constrained sort, that we don’t know how to get computers to do (yet)? And “self-expression” – facon de parler, in this context? Musical composition seems more a skill than a matter of self-expression (as would be a literary composition). I can’t see why a sense of self would be necessary for creative composition in either music or the graphic arts. Certain Idiot Savants are no doubt adept in these areas, despite autistic tendencies, that mitigate against a sense of self. Though I don’t seem to have said anything yet. There’s a sharp distinction between intelligence and consciousness. As far as we know, consciousness is the preserve of organic intelligence. We can presume that lots of rather dim animals are phenomenally conscious (even if not self-conscious → this distinction is important) so, there’s no link between getting smarter and smarter and then (as a result) getting phenomenally conscious. I’m not sure of the link between intelligence and self-consciousness. There’s an old Time article “Can Machines Think?” – stimulated by the Kasparov vs Deep Blue chess match (at Time: Can Machines Think?). This is predicated on the assumption of continued exponential growth. It’s a standard principle in scientific practice to be suspicious of exponentials, at least when they are unprincipled – ie. where there is no underlying theory that would lead us to expect them. Also, as noted elsewhere in this discussion, the occurrence of the Singularity relies on the achievement of numerous conceptual and technological breakthroughs that we have no warrant for assuming will happen any time soon. So far, computers have only enhanced human civilisation. “Ending” human civilisation (“as we know it”) depends on delivering (in an uncontrolled manner) the various promissory-notes of the Time article. Is this really the case that the rate of improvement in computing power is accelerating, and will it really continue to accelerate indefinitely, if it is so doing currently? Note that Kurzweil's graph muddles together speed and cost. See the comments below. Firstly, emulation isn’t the real thing. Models of hurricanes aren’t wet and windy, so why should emulations of consciousness be conscious? Secondly, digital computers are serial devices in which the components are (now) very quick, and brains are massively parallel devices whose components are very slow. Why should simulating one by the other produce the same (phenomenal) effect, and even be possible at all? The items on the list (“driving cars, writing books, making ethical decisions, appreciating fancy paintings, making witty observations at cocktail parties”) can all (presumably) be rules-based and situation-driven. No doubt this is true of human intelligence as well (ultimately) but modelling it is not straightforward, as we don’t know how the brain does it. The issue isn’t really (in this case) to do with “whether”, but “when”, as there are lots of major breakthroughs required before the promissory note can be delivered on. Also, all these functions can be delivered unconsciously (if they can be delivered at all). Does it matter how smart they are? Lots of equally smart people don’t share the optimism of the futurologists. Are there really no reasons to doubt that their onward exponential growth is really never going to end? Miniaturisation of components has to stop soon due to QM effects. So, a radically-new technology is needed. Some ideas are there, but we might get “stuck” on their delivery, as has been the case for controlled nuclear fusion (Wikipedia: Fusion Power), which in the 1950s was expected soon, in the 1970s by 2000 and in 2006 “not within 100 years”. There’s no doubt that computers will continue to get more powerful, as hardware and software continues to improve, as it always will. The issue is really over the rate of change (can exponential growth continue indefinitely) and can certain conceptual breakthroughs be made? This is certainly an important point, as we certainly use computers to help manufacture computers. But the extrapolation to development may involve the solution of the real “machine creativity” problem. Is this true? It would be true if machines became “smarter” than humans in every dimension of “smartness”. But “unpredictability” (ie. non-rules-based) is one of the aspects of machine-intelligence yet to be delivered by AI. Also, this argument sounds a bit like the “you can’t know the mind of God” (at all) arguments, which may or may not be sound. This sounds a more promising approach than simulation, and it’d relieve computers from having to realise consciousness. But any cognitive interlinking would still require a fuller understanding of how the brain works than is currently on the horizon. See Cyborgs8 for my thoughts on the matter. We don’t “integrate” with cars and planes any more than we integrate with computers. They are just tools. Prosthetics are the nearest analogues, but there’s a long way from that to true integration. At this stage of the argument, it’s not clear how intelligent machines will help repair our bodies and brains (especially “indefinitely”). Usually nanotechnology is invoked at this stage (see Wikipedia: Nanotechnology for an overview). Now, it’s true that intelligent machines would be needed to manufacture, and probably program, these myriads of tiny, very specialised machines, but the possibilities are very schematic. There’s no evidence that anything workable is around the corner. It looks like the free eBook by Eric Drexler Engines of Creation 2.0 — The Coming Era of Nanotechnology (Drexler: Engines of Creation (Defunct)) might prove useful. Just what is meant here? Is this just loose speaking? A thing (an animal) is conscious, and the animal can’t be scanned and downloaded anywhere. No-one really knows (at the theoretical level) what phenomenal consciousness is, though there are many theories. What’s probably intended here is that “the contents of our brains” would be read and uploaded to some device that can simulate our brains. This, of course, assumes that mind-body substance dualism is false (as it probably is), but even so – and admitting that whatever runs the downloaded software is at best a copy of the original, there’s a long way to go before this sort of thing becomes even a worked-out theoretical possibility. Well, philosophically-speaking, this is an outrageous idea. It depends on what we are9, and we’re almost certainly not software, though software is important to us. And there are issues of identity – since software is easy to copy, and copies aren’t identical, what reason would an individual have for thinking any particular installed copy was (identical to) him? Well, this is certainly something to watch out for, but I dare say it’s a way off. It’s more of a worry in genetic engineering or (if it gets going in the futurist mini-robot sense) nanotechnology. The Wikipedia article mentions Kurzweil and other futurologists, and the possible breakdown of Moore’s Law within the next 5 years or so (ie. well before 2045). It also notes that Moore’s Law is a self-fulfilling prophesy, in that the industry has taken it as a paradigm for R&D aims. Also, that the R&D costs of keeping up with Moore’s Law are also increasing exponentially. This graph intentionally muddles together speed and cost, but so-doing can lead others to draw the wrong conclusions from it. Currently, while there continue to be improvements in computing power, the current driver behind the continuing exponential growth of Kurzweil’s graph is economic – ie. computer hardware is being delivered cheaper, faster, not faster faster. 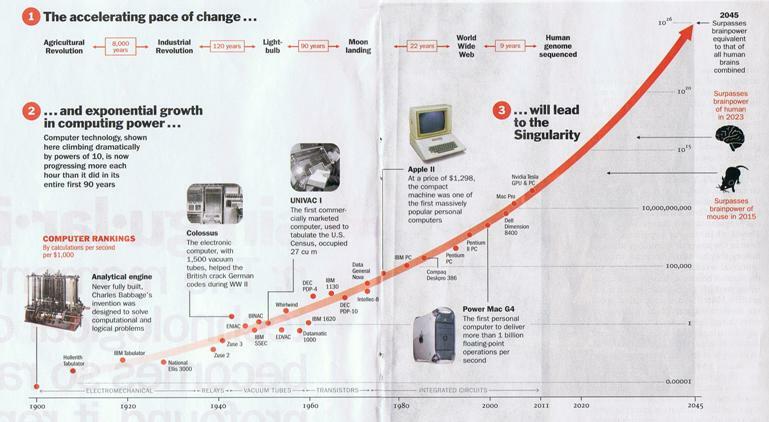 Even if Kurzweil’s graph did continue for ever, it might still not lead to the singularity, in that the (infinitely cheap) computer hardware might still not deliver what Kurzweil needs. It might still be too slow. Details to be supplied later! Currently the links are one-way. Some of these links now fail, as indicated. Some other links work, but don’t have the same text. I’ve not had time to chase them up and make repairs, if possible.